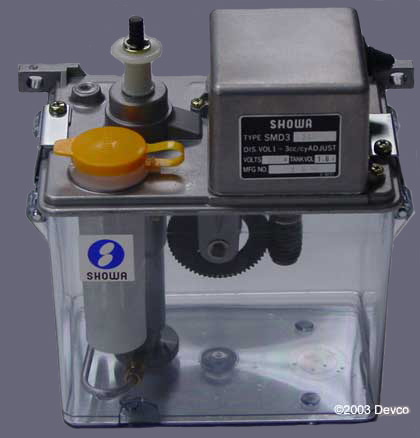 Model SMD is an automatic cyclic pump for resistance lubrication system. Pump specifications are the same as the Showa SMA. However, this model comes with the terminal blocks for easy wiring and an inlet filter basket as standard accessaries. Options include a float switch and protection cover. If your needs require a more Heavy-Duty Pump take a look at the Showa YMAS. An optional Low Level Switch is available for all models.